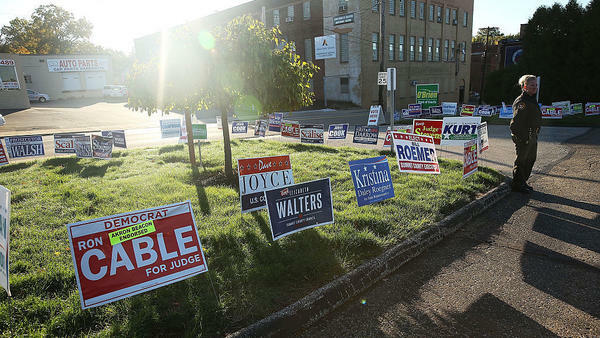 Campaign signs are placed outside a polling precinct open for early voting in Akron, Ohio. 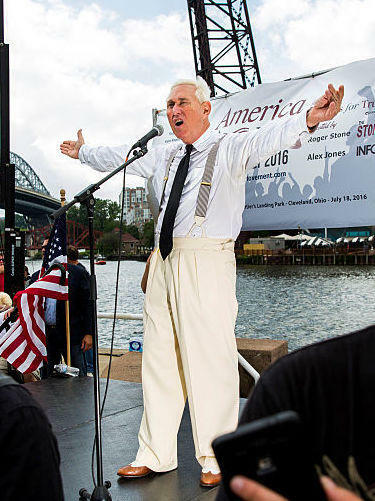 Roger Stone, an informal adviser to Donald Trump who is setting up a poll monitoring operation, speaks at a rally on July 18, the opening day of the Republican National Convention, in Cleveland. One question on many people's minds is whether polling places will be disrupted on Election Day. There are concerns that vigilantes, armed with cameras and notebooks, will intimidate voters they suspect of committing fraud. Such groups insist they'll follow the law, but civil rights groups are on alert just in case. There have already been some disturbing incidents. In Durham, N.C., a voter reported someone videotaping license plates outside an early-polling site. In West Palm Beach, Fla., a voter complained of being intimidated by a rowdy group of electioneers. A right-wing group called Oath Keepers has appealed to its members, mostly former military and police, to go undercover at polling sites and collect intelligence about possible fraud. In an online video, the group's president, Stewart Rhodes, asked supporters "to go out as part of our call to action, to go and hunt down, look for vote fraud and voter intimidation and document it, to do the best we can to stop it this election." There are other efforts as well. A Texas-based group called True the Vote has a smartphone app for people to document any incidents of voter fraud they see at the polls. Conservative activist Roger Stone, an informal adviser to Republican Donald Trump, is organizing something called Stop the Steal. He plans to have several thousand volunteers outside mostly Democratic-controlled precincts — in places like Philadelphia and Cleveland — to conduct exit polls as evidence of whether or not the election is rigged. Stone insists the poll takers won't be there to intimidate, just to ask a few questions.
" 'Pardon me, did you just vote?' 'Yes, I did.' 'Would you mind participating in this exit poll for the purposes of determining the accuracy of the election?' 'No thank you, I'd rather not.' 'OK, thanks. Have a great day.' It's that simple," he says. "There's no intimidation. And it's after they voted. Who would go intimidate voters after they voted? What would be the point of that?" But in the current political climate, liberal voting rights groups are extremely skeptical. They've recruited thousands of lawyers and other volunteers to monitor the polls on Election Day for signs of intimidation. The coalition, called Election Protection, has already fielded tens of thousands of calls at its Washington, D.C., hotline. "Most certainly we are receiving more complaints this election cycle," says Kristen Clarke, president and executive director of the Lawyers' Committee for Civil Rights Under Law, which is leading the effort. Clarke blames Trump's repeated call for his supporters to monitor the polls for fraud, which he claims is widespread, despite evidence to the contrary. "What we're seeing is basically a clarion call for people to go out and lurk outside of polling sites," she says. "I think that all of this presents cause for concern." She's especially worried that the efforts will target areas with large numbers of minority voters. State Democratic parties in Nevada, Arizona, Pennsylvania and Ohio have filed lawsuits against the state Republican parties, the Trump campaign and Stone, claiming that they're conspiring to threaten, intimidate and prevent minority voters from casting ballots, something Republicans deny. All of this comes amid heightened concerns among election officials about confrontations at the polls, between voters and aggressive monitors. But Republican election attorney Ben Ginsberg thinks some of those fears are overblown, in part because states have rules governing who can and can't monitor voting inside the polls and what they can and can't do. Most have to be trained and certified, and appointed by either campaigns or political parties. "Vigilantes cannot come waltzing into a polling place and start disrupting the voting," says Ginsberg. "So I tend to think that this is more the pregame hype." In fact, the Trump campaign appears to be directing those who sign up on its website to monitor the polls to state GOP efforts to appoint official Election Day poll watchers. But it's the unofficial ones, especially those outside polling places, that people like Clarke are most worried about. FESSLER: In fact the Trump campaign appears to be directing those who sign up on its website to monitor the polls to state GOP efforts to appoint official Election Day poll watchers. But it's the unofficial ones, especially those outside polling places, that people like Kristen Clarke are most worried about. Pam Fessler, NPR News. Transcript provided by NPR, Copyright NPR.